Saturday was a full day of classes, chatter, swaps, gifts and sharing. My first class was machine quilting with Trudi. Wow, she is so good! I can't say my skills improved but I learned so much in her class and will keep on trying to some day be able to free motion quilt even half as well as Trudi does. Did you know there is a right and wrong side to needle punched batting? That's just one of the little secrets Trudi shared with us. We practised on quilt sandwiches that we had brought with us. I was lucky to be able to share a machine with someone. My next class was photography with Judith and she really helped explain the settings on our DSLR cameras and gave us some great pointers for photographing our projects to be displayed on our blogs. I am trying to get back to using my DSLR and not use iPhone photos quite so much. I received some sweet gifts on Saturday, too. 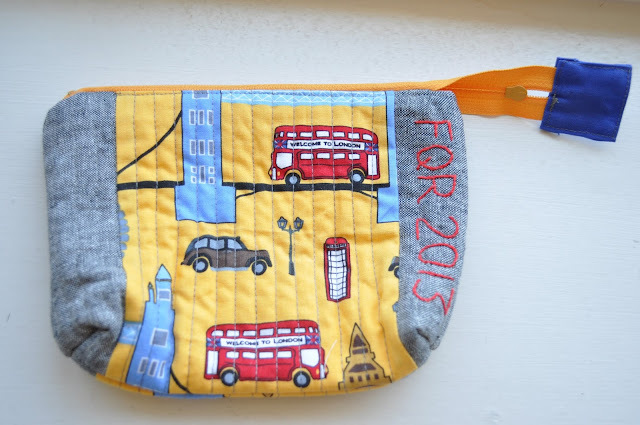 and a perfect little pouch to remember London and my first FQ Retreat, from Susan. You might remember these cosmetics cases that I made for the sample swap. These are the gifts I received in exchange for them. How perfect is it that I got a soft Matryoshka doll from the lovely Jo? 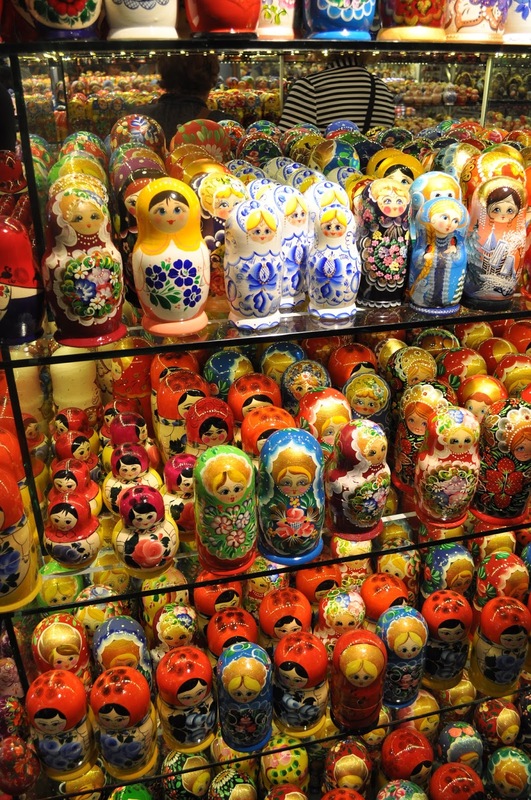 We saw the real dolls all over St. Petersburg. Krista made the super cute little house that has a retractable measuring tape inside and Sonia made the crocheted heart ornament. Because my crochet skills are limited to granny squares I can really appreciate this little ornament. All these things now have pride of place in my sewing room. I can hardly wait to get the walls painted so I can really decorate the room. Did I mention there was an awesome swag bag? Thanks to the amazing sponsors. I won't promise to mention them all because my brain is having a lapse...but just to mention a few...Aurifil, Pat Bravo, Liberty, Village Haberdashery, Fat Quarter Shop and so many more. 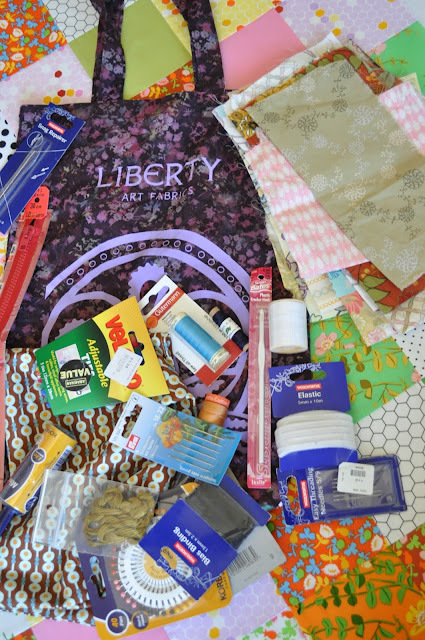 During our lunch break on Saturday, Rachel suggested we run over to Shaukat; they carry the largest stock list of Liberty fabrics and at a discounted rate. I bought three meters of this fabric and yesterday bought this pattern. Hopefully the two will be a match made in heaven. It's been a very long while since I have done any garment sewing for myself. Dinner in London has so many possibilities but there was only one choice for us this night. Dianne, Helen, Katy and I are all part of the Stitch Tease bee and we were missing our friend, Annabella, who was not able to attend the retreat this year. Did I mention Bella lives in Morocco? 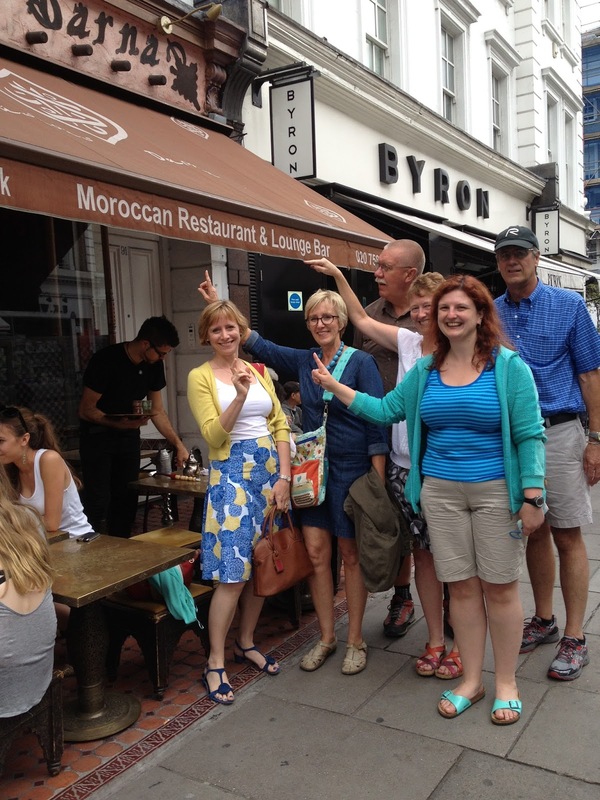 We walked by this Moroccan restaurant and we just had to eat there because it would be like we were visiting our friend. First we had to ham it up outside the restaurant. Jan joined us too and it was so nice to meet her. This grainy photo shows you that the guys were still having a good time in spite of all the quilty chatter at the table. The food was really good, too. I had the tangine made with chicken, olives and preserved lemons. 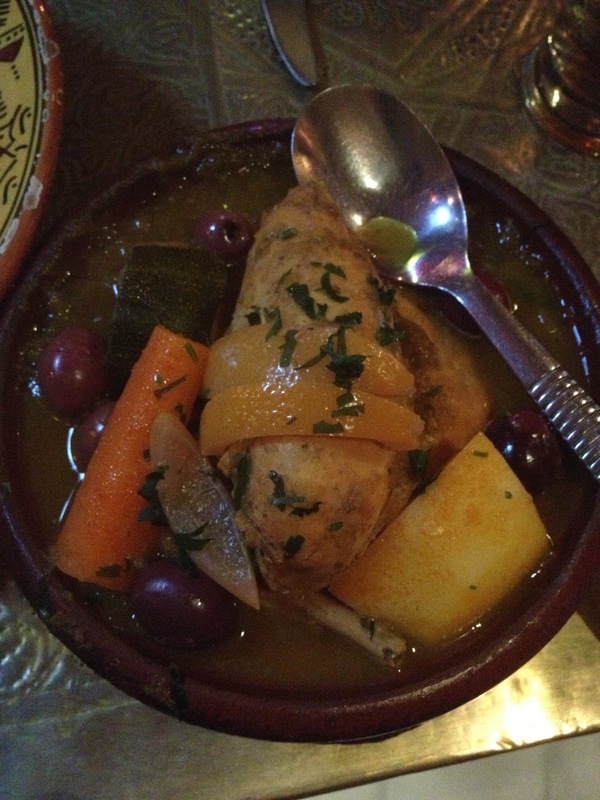 and it had to be accompanied by a Moroccan beer. There was still lots to do the next day. 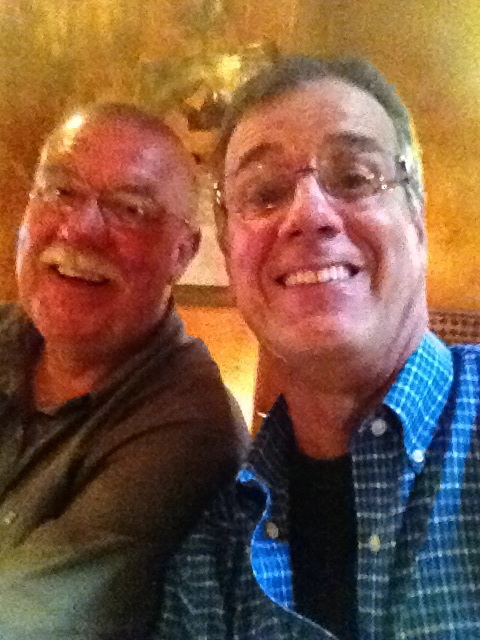 My last class was Blogging with John. His class was informative and he shared his top pointers for a good blog. His ideas confirmed that I am doing about 70% of things right. Too soon it was time to say goodbye. But not before we gathered for photos. There were two quilts in the house that I had participated in making. The first was Katy's Stitch Tease quilt. It was so cool to have 6 of the original 8 members there to hide behind pose with the quilt. Isn't it just fabulous? My block is the bottom left. I am also a member of the Modern Stitching Bee. This is Cindy's quilt top. 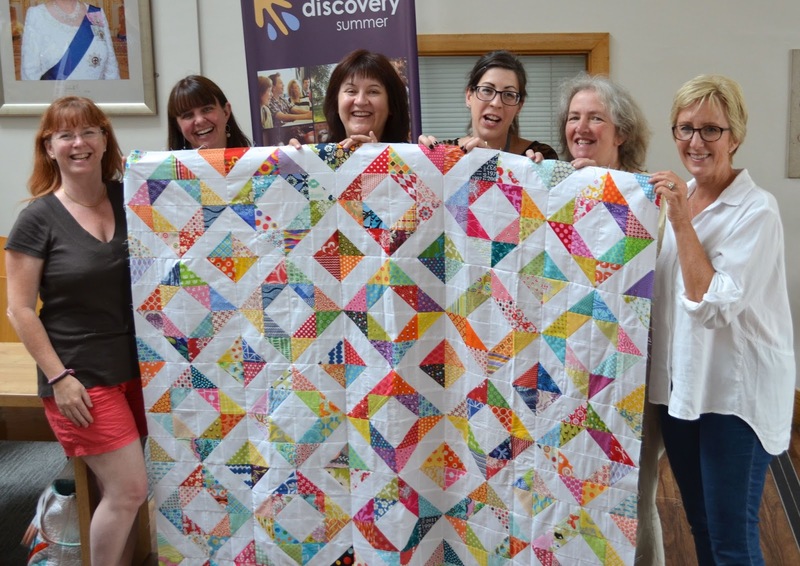 It's so fun to see the work of everyone come together in a beautiful, scrappy quilt top. Sunday morning came and went really fast. It was time for people to clean out their hotel rooms and hurry to the train or get home and frost cakes for their kid's school functions. Time to say goodbye; insert big tears, lots of hugs and promises to return, meet again sometime soon and keep in touch. Two friends even promised to come to a retreat in the US and I am holding them to it! A special thank you to all the Fat Quarterly Retreat team. Sometimes we forget that these are regular people; moms, dads, quilters with real jobs and responsibilities just like the rest of us. It is easy to say they should have done this or that differently, but in the end it is a ton of work and we all had a great time. INSERT STANDING OVATION HERE! With everyone going their separate ways, Mr. R and I decided to take a walk through Regent's Park. It was a beautiful evening and the perfect way to spend our last night in London. We enjoyed dinner at the same restaurant we ate at on our first night in London, Zizzi's. I am so glad to finally get these posts finished. 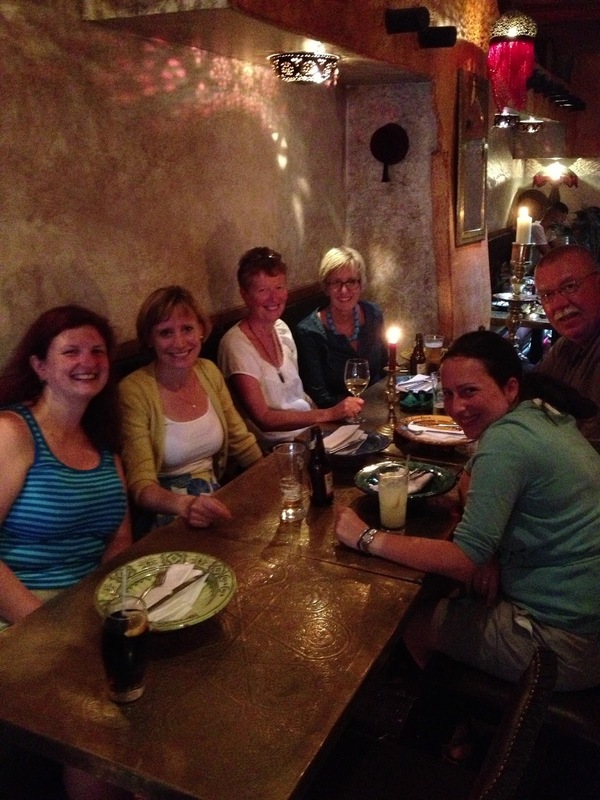 Sometimes it's difficult to blog about an experience. I can tell you the facts but you might not read all the emotion behind the words. Fat Quarterly Retreat was a wonderful experience. But it's the people I will remember the most. I have a crochet heart exactly like yours- mine was made in Tasmania! Great to see the Cindy's Modern Stitching Bee! Looks like you had a ball! So glad you had a great time at the retreat and met so many of the ladies that you've been cooresponding and in a bee with over the years. I sure hope your friends come out to the US for a retreat here. Brilliant post. You summed it up perfectly. You know when we outside the restaurant? I didn't get at first why you all wanted pictures of you pointing at the sign. I looked at the sign and thought what's special about that?! Oh and love the dress pattern you've picked out. I reckon I could manage that so must look out for the pattern. It's like we were back there again! Love the dress you've chosen to make!